An Italian Muslim has been snatched by the CIA. His crime: a plot to engulf Venice in flames. Carnivia is awash with rumour and speculation. Have the CIA extradited an innocent man? Holly and Kat must find the powerful men who truly run Italy. But time is running out to save their city. THE ATROCITY will destroy it all. 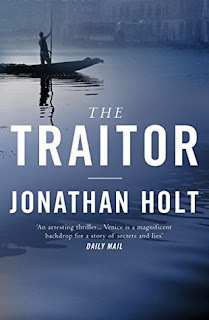 The Traitor, sadly, is the last of the Carnivia Trilogy, which has been a fantastic series for me, and once again sees Kat, Holly and Danielle’s lives drawn together on the streets of Venice. If you like crime books: READ THIS BOOK. One of the things I really like about this series its reality that it gives. Drawing in from a lot of current situations and political references...right down to all the talk of traditional venetian food and its names included throughout, that give it this life, like this is really happening in Italy, rather than a crime book that is just set in a modern location. I love the idea that I could go to Venice and walk past Kat (ha I think I’ve said that before..whoops), and indeed whenever I eventually get there this will be all I’ll be able to think about…well that and Carnivia. What a fantastic idea Carnivia is. Social media but in a twisted, contrived way, where Facebook meets World of Warcraft and meshes into this alternate reality of Venice that feels like it could be a thing, and something that people would completely embrace, and that in itself is scary. It also presented a fantastic (mental) image of Venice, and cleverly explored throughout the series a darker side to the way that people operate and behave through social media. For some reason the 'threat' of the book (or rather the crime) here felt less…maybe for me it was the technical, coding nature of cyber terrorism and I’m just use to massive full scale old school crime, but it felt like this was more part of a bigger story than a focus. Whilst I’m sad this is where Carbivia ends, I’m looking forward to reading more from Jonathan Holt who is a fantastic strong new voice in crime....read this series!